Spice Bazaar rests at the core of a hugely successful movement in color. 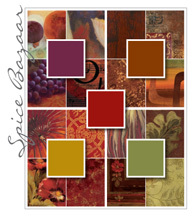 Designers render styles including Tuscan, Bohemian, African, and Latin out of this one palette alone. The rich, inviting, earth-bound colors have driven products and interior design for over ten years, allowing consumers to become deeply invested in their personal spaces. The depth and range of Spice Bazaar provide ample momentum to keep it central to design going forward, even as hues slowly clean and liven. Spice Bazaar is all about amazing color with the ability to please.